Master of Kung Fu: Snowbuster! I’ve covered a lot of superhero territory in the past sixty-seven issues of Longbox Graveyard. Aside from side-trips to look at undead counts, giant radioactive lizards, and a continuing dalliance with a loin-clothed barbarian, this blog has been all about men (and women!) in tights. It’s fair to say that I am obsessed with comic book superheroes. But I admire some real-life superheroes, too. They’re exceptionally rare: Ayrton Senna behind the wheel of a race car. Stephen Hawking unraveling the mysteries of the universe. Jackie Robinson just being Jackie Robinson. 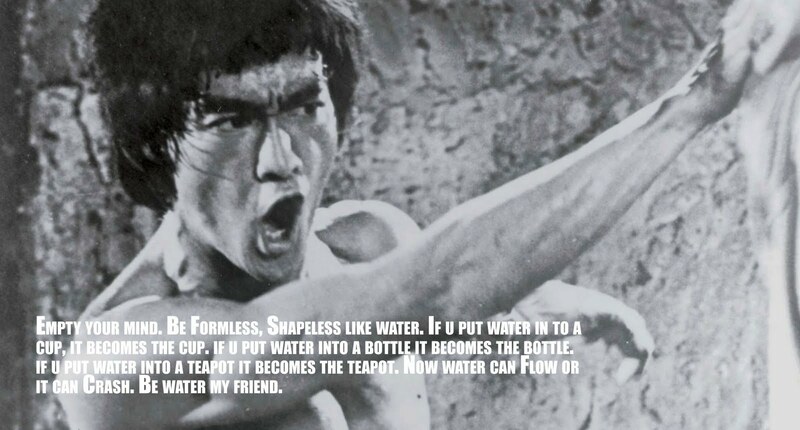 Bruce-freaking-Lee was an honest-to-gosh, living and breathing superhero. I still can’t believe that he’s gone. I’ve written before about how 1974 was a watershed year for me. At the age of twelve I moved to Hollywood, CA for several months, and it was while prowling the geek shops of Hollywood Boulevard that I cemented my life-long love of comic books, science fiction, monsters … and Bruce Lee. 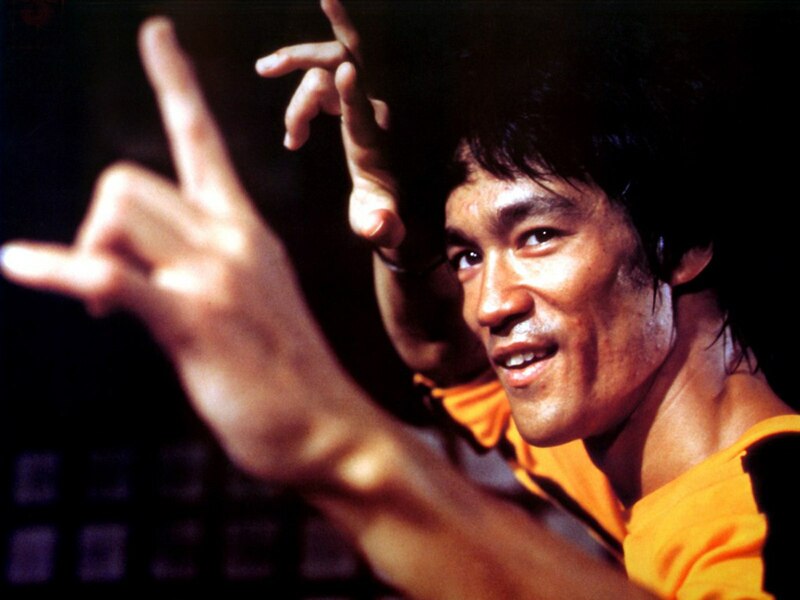 It is one of history’s cruel ironies that Bruce Lee died just days before his 1973 film Enter The Dragon made him into an American cinema superstar. Lee was an “overnight” success story years in the making, after having appeared on American television in the 1960s before becoming an international superstar in Chinese cinema in the 70s. … so much so that I must have sneaked into repeat showings of Enter the Dragon at least a half-dozen times in 1974. That summer, Hollywood Boulevard was a shrine to Lee, with his photo in every gift shop window, and his films playing in several theaters (this was back when Hollywood Boulevard had theaters). When I wasn’t reading comics that summer, you’d find me in a theater taking in multiple showings of badly-dubbed versions of Fists of Fury and The Chinese Connection that were rushed into U.S. distribution to capitalize on Lee’s posthumous fame. Idolizing Bruce Lee was bittersweet, knowing he was gone, clinging to the urban legends that circulated at the time — that Bruce wasn’t dead, that he had faked his death to retire to a Shaolin Temple, or gone underground to evade vengeful Chinese gangsters. It just didn’t seem possible that such a specimen of superhuman strength and ability could have died. He … was … a … superhero, and superheroes don’t die! Even decades later, my heart skips a beat when Bruce bounds up the stairs in the final act of Game of Death, replacing the imposter who filled his shoes for the first hour of that otherwise-unwatchable picture. It’s like he’s come back to life, to fight and amaze and entertain one last time, and rip the scab off the wound I still carry for his loss. 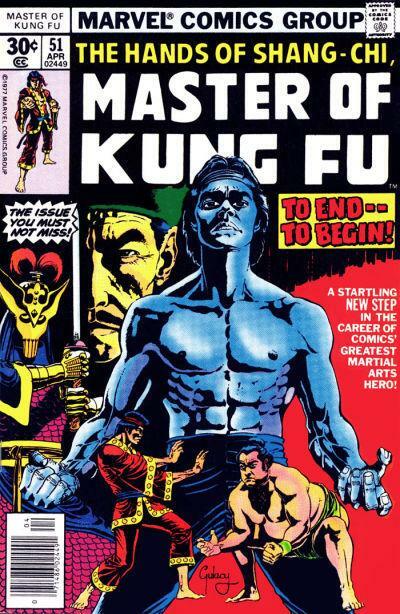 Marvel Comics was never one to miss a trend, and they jumped on the American martial arts mayhem bandwagon with a number of comic books — and the best and longest-running of them was Master of Kung Fu. 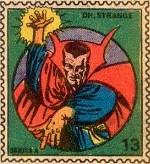 Created by Steve Englehart and Jim Starlin in issue #15 of Special Marvel Edition, the book had just recently assumed the Master of Kung Fu title when I first encountered the title with issue #21 on the rack at my favorite Hollywood newsstand. 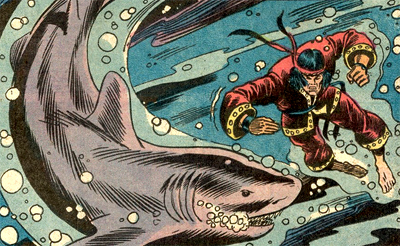 I’m sure I was looking for Bruce Lee heroics when I read that book … but what I got was lackluster Sal Buscema art, and a scene where the hero karate-chopped a shark. This is crap, I thought, and went back to reading superhero books. It would take thirty issues before a chance encounter with Paul Gulacy’s cover for issue #51 convinced me to give Shang-Chi another chance. It was a strange time to jump on the book, given that issue #51 was a transitional story: an epilogue to arguably the greatest Shang-Chi story of all which had concluded the issue before. I didn’t care. The title had matured in the time I’d been away, and my own tastes had evolved, and now I was the perfect audience for Master of Kung Fu’s unique 1970s blend of espionage, intrigue, and martial arts action. I would remain a loyal reader for the remaining seventy-four issues of the book’s run, and in time would fill in the issues I’d missed. My complete run of the Doug Moench-era of Master of Kung Fu remains the jewel of my Longbox Graveyard collection — not especially valuable books, but possibly my favorite comic series of all time, and somehow sweeter for having never been made available in reprint or digital form. 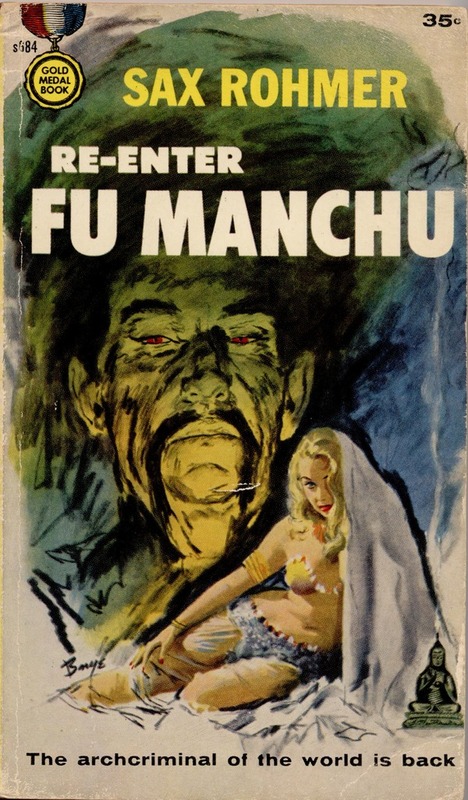 The reason there are no Master of Kung Fu reprints is generally attributed to copyright issues stemming from the book’s origin in Sax Rohmer’s Fu Manchu pulp series from the 1920s, though it may also be that the “yellow peril” stories of Fu Manchu rightly belong to another age. The comic does borrow from the pulps, picking up the adventures of Rohmer’s heroes Denis Nayland Smith and Dr. Petrie as they carry their battle against the Asian crimelord to the modern era, and Fu Manchu himself is a consistent presence in comics. For the most part, though, Master of Kung Fu is an original work, spring-boarding from Rohmer’s premise to tell the tale of Shang-Chi, an original character who is the son of Fu Manchu, raised by his evil father to be the ultimate assassin. Learning the error of his ways, Shang-Chi swears to oppose his father, beginning a journey of transformation in keeping with his name, which we are told means “Rising Of The Spirit.” Throughout the series we are treated to rich characterization, a deep and intriguing supporting cast, some weird and wonderful bad guys, plenty of espionage and double-dealing, and of course a fist-full of cinematic Kung Fu action. My reasons for not reviewing Master of Kung Fu before now at Longbox Graveyard are complex. Partly it is down to a publication and reading schedule driven by summer movie tie-ins, but mostly I’ve put it off because I was afraid the series wouldn’t measure up to my memories. We’re talking about a Marvel book from the 1970s here, and not every title from that era has aged especially well. But I needn’t have worried. A recent re-read confirms these are still terrific books, and I look forward to revisiting them with you in a series of articles in the months to come. To start, I’m concentrating on a short and not terribly distinguished run of Master of Kung Fu — issues #29-31 from 1975. This is the first run where I felt the series really came together as author Doug Moench and artist Paul Gulacy first found their mojo, largely by embracing a genre movie style that instantly distinguished the book from superhero titles of the day. 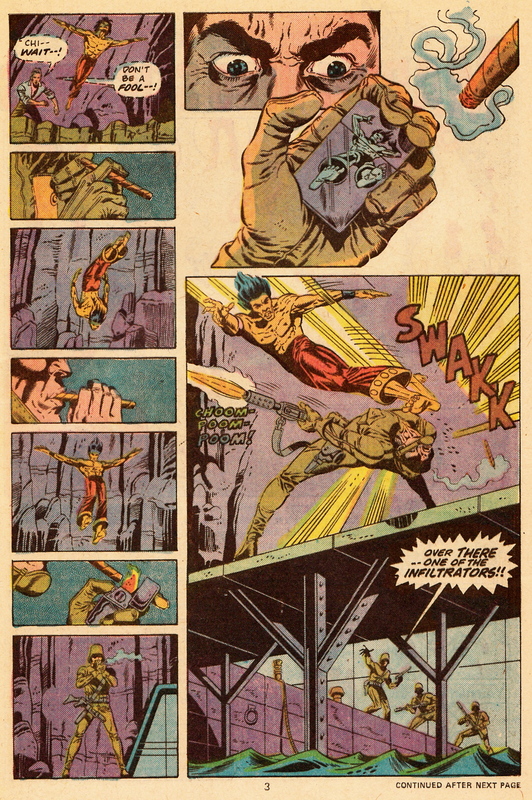 Earlier issues in the series do have their moments, though, such as these two pages from issue #25, notable as the flash point where Paul Gulacy starts to cut loose. … but it is really just a flash of lightning for what is to come. The thunder starts to roll in with #29’s “The Crystal Connection,” the first issue in the three-part “Snowbuster” arc, where the Master of Kung Fu storytelling DNA really starts to emerge. It is with this issue that the creators fully embrace a cinematic style. Previous issues were awkward martial arts pulps, with Fu Manchu lurking behind every potted palm, but starting with this tale, Shang-Chi’s world starts to broaden. Now a member of MI6, Shang-Chi is part of a team tasked with throttling a pipeline of heroin at its refining source in the Mediterranean. The story set-up and briefing scene that leads the issue is clearly inspired by a similar set-up in Enter The Dragon, where Bruce Lee’s character was tasked by the British Secret Service to investigate a heroin operation in Hong Kong. 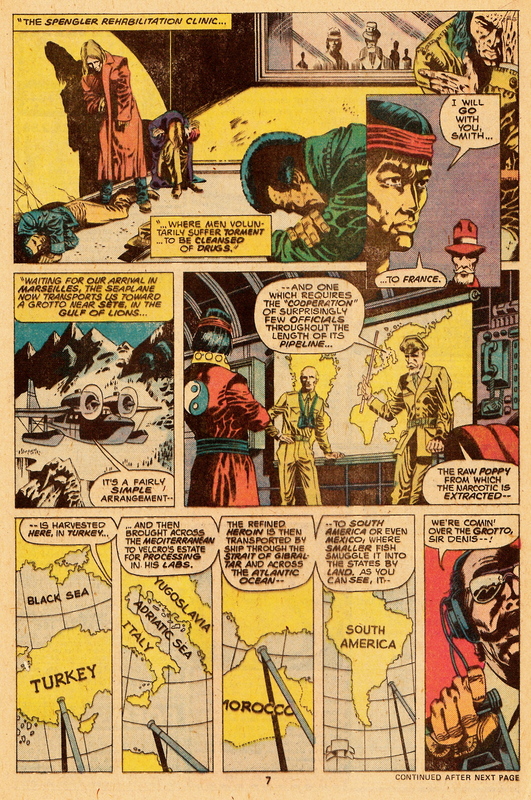 But Moench and Gulacy were even more interested in a different kind of movie — a few pages later, we’re in the middle of a James Bond picture, as team member Clive Reston (who several times in this series suggests he is Bond’s son) arrives at the fortress of the unfortunately-named drug lord, Carlton Velcro. True to the Bond formula, there’s repartee between Reston and the evil mastermind, Bond girls lounging around a pool, and the introduction of the bad guy’s privileged henchman — in this case, Razor Fist, fulfilling the role of an Oddjob or Jaws. From the moment Razor Fist is introduced, we know it’s just a matter of time before he comes to blows with our hero, and the confrontation is teased in the final panel of the issue. The battle is worth the wait, and the fight between Shang-Chi and Razor Fist in issue #30 also illustrates another critical distinction of this series. 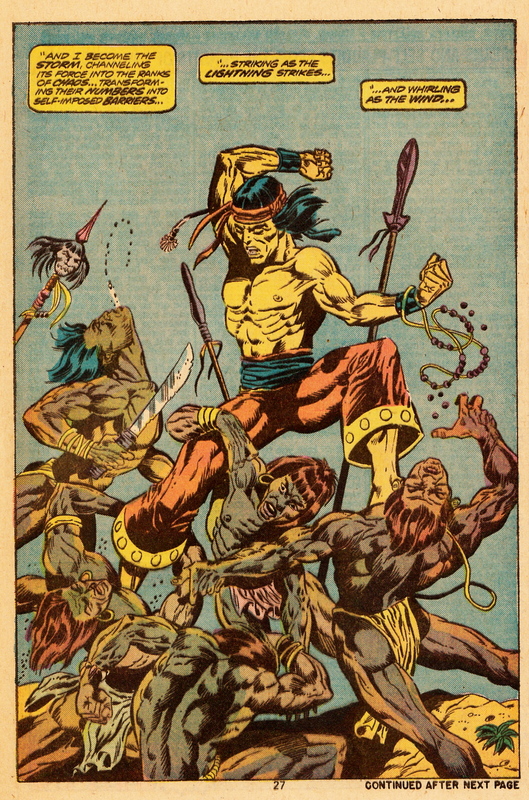 Master of Kung Fu was a Marvel book, and while cross-overs with the rest of the Marvel Universe were mercifully infrequent, this comic still had to compete with Spider-Man, Iron Man, and a whole host of superhero titles that took their fighting action to places that were beyond Shang-Chi’s capabilities. 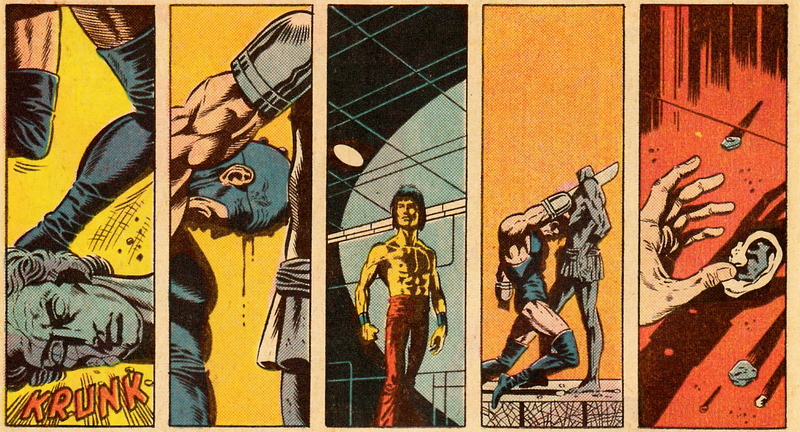 Shang-Chi may have been a master of Kung Fu, but he couldn’t stick to walls or bounce bullets off his armored chest. To offset his non-powered disadvantage, Shang-Chi’s action scenes go inward. 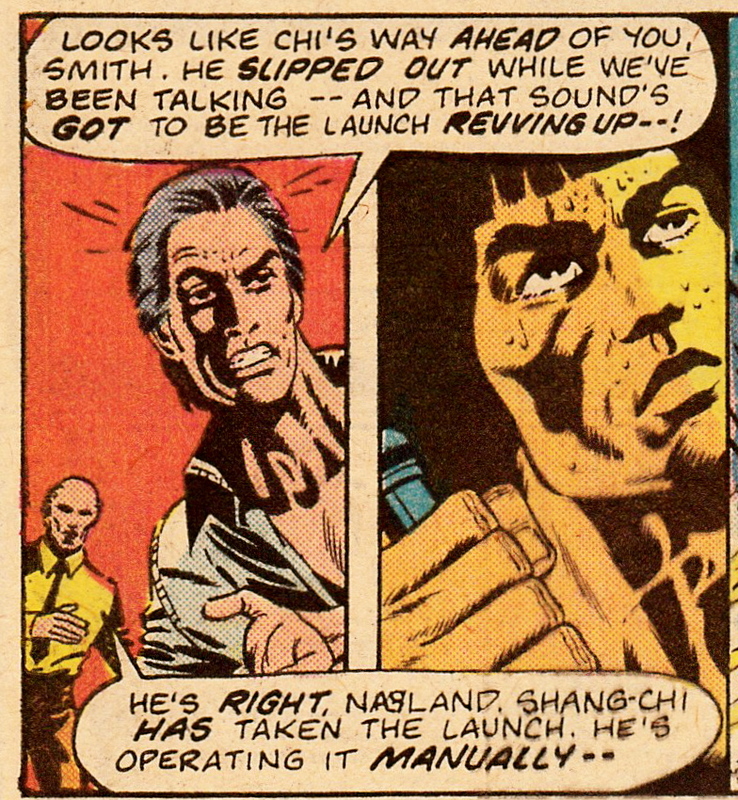 Narrative captions slow down the action and help us see the battle through Shang-Chi’s eyes. The result are thoughtful fight scenes that reinforce the meditative and philosophical tone of the book. Over time, Shang-Chi’s philosophy would evolve from his initial fortune cookie homilies to legitimate self-searching about the violent games of deceit and death in which he found himself a pawn. Moench also knew when to be silent, and let Gulacy’s cinema-inspired images tell the tale. There’s more than a little debt to Jim Steranko here, as well. 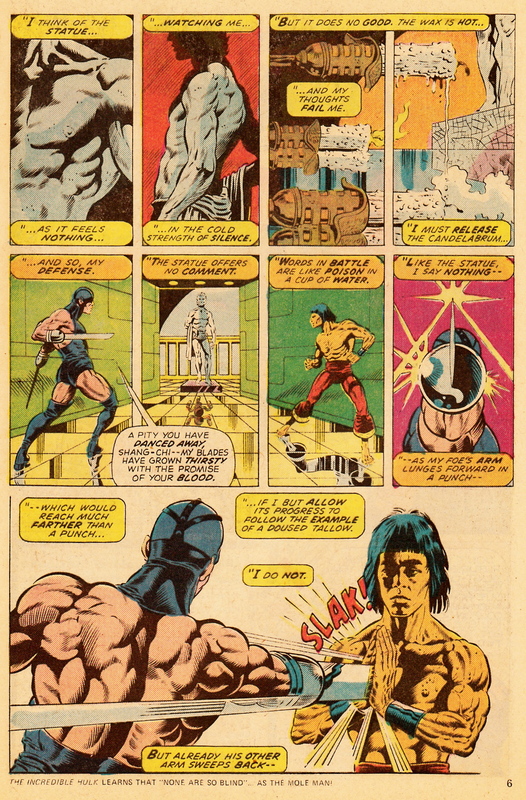 The cinematic style fully flowers later in issue #30, where Gulacy uses multiple panels to capture split-seconds of continuous action, and also goes all-in drawing Shang-Chi to look exactly like Bruce Lee (particularly in the penultimate panel of the page below). Gulacy has also contrived to have his hero go shirtless, further reminding us of Lee, and distancing us from Shang-Chi’s horrid Ying/Yang pajama costume. In issue #31’s conclusion, there’s no doubt that Master of Kung Fu is an action movie, with our heroes plastered across a movie-poster splash page of a story “produced and directed” by Moench and Gulacy. The Bond references keep coming fast and heavy, with Clive Reston now reminding of a young Sean Connery, and Shang-Chi continuing to sport a Bruce Lee look. We also get another Bond trope — a femme fatale spin on the privileged henchman, as Shang-Chi battles Velcro’s lover, Pava’ne. Again, what might be conventional action is improved by slick panel construction and Shang-Chi’s narrative caption admitting he took his opponent lightly because she was a woman. 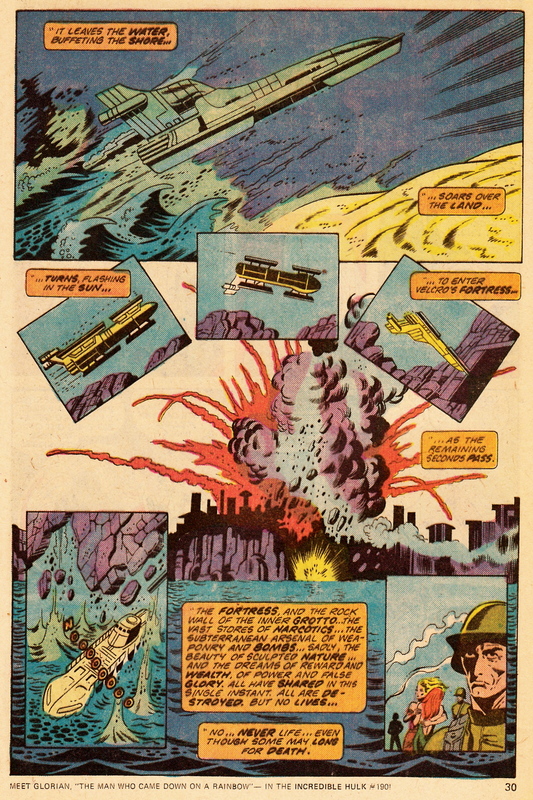 And what would a Bond movie be without the evil villain’s secret island base blowing up just before the credits roll? The film influence is particularly keen in this spectacular page from issue #31, where the passage of time is visually communicated by the guard lighting his cigar. The guards actions serve as a fuse, burning down to an explosive climax as Shang-Chi drops down from above. The inset panel of panic in the guard’s eyes as he glimpses Shang-Chi in the reflection of his lighter is a striking moment of frozen time that goes beyond cinematic convention, as the juxtaposition of the guard’s eyes and the reflection in his hand would be difficult to achieve on film without resorting to a gimmicky split-screen. By clearly positioning the guard’s hand in front of the inset panel showing his expression we experience the kind of action composition that is unique to comics as a storytelling form. In case it isn’t obvious … I love this page, I love this issue, and I love this series, which I offer my unreserved recommendation. 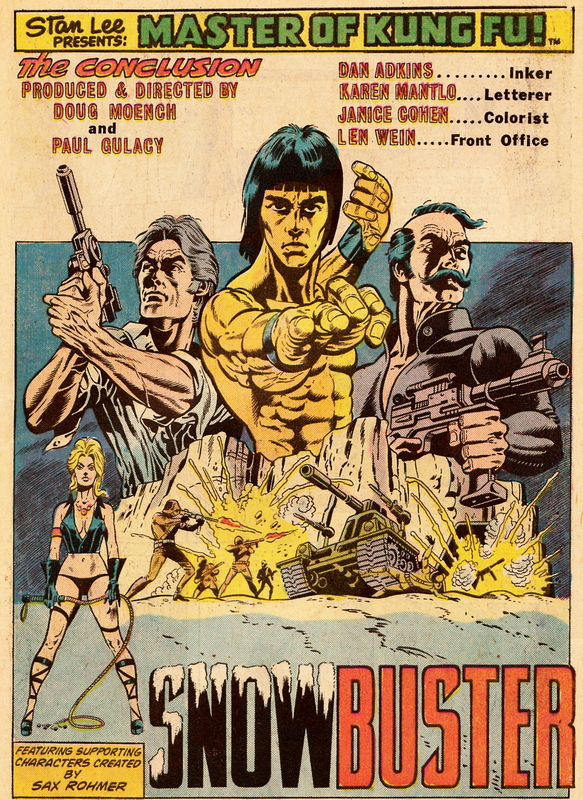 This three-part “Snowbuster” story isn’t the strongest run in Master of Kung Fu, but it is a worthy jumping-on spot for the series. And since I’ve already rambled on for two thousand words, I am going to break with tradition and confine this Master of Kung Fu review to these mere three issues, rather than trying to appraise the series as a whole. But I do so with a promise to return to Master of Kung Fu sooner rather than later, and also to examine this series in closer detail than has been the rule here at Longbox Graveyard. The book is good enough — and sufficiently significant to the form — to warrant close attention, still fun and fresh and entertaining after all these years. Plus it helps this still-heartbroken fan imagine what it might have been like if Bruce Lee had lived to enjoy the popular action film career he so richly deserved. Over time, Master of Kung Fu evolved its own distinct identity, but I still can’t help but link it to Bruce Lee in my mind. Rest in peace, Bruce, you are still deeply missed. 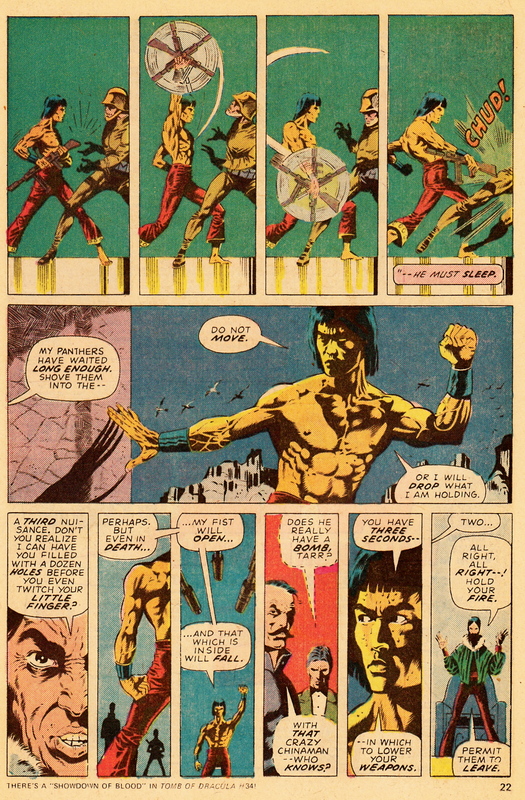 Posted on October 3, 2012, in Reviews and tagged Bruce Lee, Doug Moench, Enter The Dragon, Kung Fu, Martial Arts, Marvel Comics, Master of Kung Fu, Paul Gulacy, Shang-Chi. Bookmark the permalink. 33 Comments. The Gulacy MOKF was a short and glorious period, Mike Zeck’s long run had some excellent stories, and Gene Day’s art brought tears to the eye, but the glue was Doug Moench. His writing was uniformly excellent and he introduced me to Fleetwood Mac, being listened to by Leiko. These are comics I will not part with. I wish I had every issue. This is one of my few complete runs, if you count only the Doug Moench era. I would like to go back and fill-in the original Engelhart/Starlin issues someday (as I have never read them). I, too, associate this series with Fleetwood Mac, the creators were obsessed with the “Rumors” album which features heavily later in the run. I recall Leiko Wu dancing to that music at some point … and I will get to Leiko’s first appearance in my review of the “Mordillo’s Island” MoKF arc in a couple weeks. I’ve waited a long time to get back to Master of Kung Fu but now that it is here the features should start coming fast and furious. Ooh. Yes. The Mac. Rumours. Leiko. Kung fu. Can’t wait. Awesome clip! ❤❤❤❤❤ Bruce! Oodles! Wow, this review has me psyched! I feel like watching Enter the Dragon now. I am totally on board with three of your four heroes, but I’m not into race car driving, so you can figure out which one I’m not on board with. I, too, am a huge Bruce Lee fan, and just recently watched “Bruce Lee: A Warrior’s Journey” (excellent) and “Curse of the Dragon” (pretty good too). Unfortunately, I didn’t get into martial arts stuff until college, when I had mostly stopped collecting comics. As a result, I never was into MOKF, though I’m not sure I’d have bought if even if I was into martial arts earlier. After all, I was as big a Star Wars fan as there was, and I wasn’t into the Star Wars comics at all (crappy art didn’t help). I was strictly a superhero guy when it came to four color reading pleasure. Anyway, I too still find it hard to believe he is gone. He was so powerful and so full of life and so young that it doesn’t seem fair. It’s also a shame that he never got to finish Game of Death, which could have been his finest picture but instead is his worst. I’m very glad to hear you say that the greatest Shang-Chi story concluded with #50, because (as I mentioned after yesterday’s post) that just so happens to be the issues I recently bought! Lucky me. It does annoy me that these aren’t available in reprints. The art in your scans is awesome. I’m looking forward to reading my issues now. Dave, check out the “Senna” documentary even if you aren’t a racing fan. It’s available on Netflix streaming. He was a transcendent figure. And I am anointing that “Golden Daggers” run as the best of MoKF based on decades-old memories, so beware! We’ll see how those memories hold up as I get to those issues in my re-read. I am with you in thinking that the original printing of these books is the best way to view them (not that we have reprint options). The murky, pulply look of the originals serves the story well. These scans are all from my own books (save that shark shot), but I have artificially boosted the color a step or two to make them pop — my originals are quite faded. I have transitioned to digital comics for most of my reading, and you can’t beat the convenience of a digital screen shot for blogging, which is why my Tomb of Dracula review in a couple weeks will have digital shots, when it would probably be better served by scanned originals. The blood is running thin here at Longbox Graveyard, for which I apologize! You’ve done a color boost? That’s above and beyond, my friend. I can’t get into digital comics. I look at a computer screen enough as it is. Besides, I like the look, feel, and smell of a real comic. Still, digital does have it’s advantages, such as not taking up space in the house. The wife would approve of that! only got hold of Shang Chi through b/w reprints in the UK (in 4/5 page installments!) – I remember one sequence involving construction cranes; surprised to hear it hasn’t been reprinted. However I might hope that it isn’t reprinted on glossy paper (for which they seem to re-colour them too garishly; the colour achieved in the pulpy-paper originals was often beautiful and … pulpy! However II an Essentials volume or two would be fine! Wonderful to appreciate the cinematic art of Gulacy again and the, sometimes, sublime Moench script (or non-script). Can’t imagine how MoKF would fare in chunks of 4-5 pages, it really was one of the best “longer read” comics of its era and was heavily dependent on pace. In fact I think the best way to read the book is in bursts of 3-4 issues at a time, though I liked it well enough when buying it off the rack on a monthly basis in the 1970s. Ironic that the book has not been repackaged as it is ideally suited for graphic novel republication. My MoKF coverage will be chronological so there will be a lot of Gulacy here in the short term, though I am also looking forward to the Mike Zeck era, where I remember the book really maturing and growing into its own unique thing. These page selections certainly make the series seem more appealing than anything we’d seen before. You’ve sold us on giving this one another shot. We got a battered copy of the one with all the toys-as-weapons, and it was terrible! No one wonder someone let it go for 20 cents. We look forward to your doing all the hard work of picking out the true gems from this run! The Zeck art in the ads looks amazing. We were huge fans of his in the 1980s Marvel work but had missed his Shang-Chi run by then. The two Moench/Gulacy “Six From Sirius” limited series have been favorites of ours for a long time. Looks like it’s time to dig into their kung-fu work. I came across a full run of Six From Sirius when sorting through the Accumulation a couple weeks ago. It’s in my “Bubble Box,” awaiting a decision to read it or move it out. There are some weak Shang-Chi stories, make no mistake. The key with this series is to identify the superior runs and experience them all in one sitting. Let me be your trailblazer, Mars! “Snowbuster” is pretty decent, though it is obvious the series is still finding its footing. “Mordillo’s Island,” which I will review in a couple weeks, takes a step back but still has much to recommend it. After that … we will see how my memories match up to the reality of re-reading this book after so many years. So far, so good. Good overview! I’ve always thought MoKF was a great book, and as a kid it was one of my must-read titles as soon as I got a copy. I was heavily into the Bond-spy-thriller stuff then and MoKF really fed into that for me. The art by Gulacy was certainly Steranko-influenced, but he was gone and no one else in the Marvel universe was drawing like that. 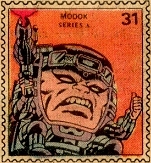 MoKF was one of those 70s Marvel titles that just felt like it snuck in – Spider-Man and the Avengers weren’t always popping in, Reed Richards technology didn’t just show up to help the cast fight Dr. Doom. It felt like its own thing with a wild cast of interesting characters. In many issues, Shang-Chi’s storyline is the weakest and yet the issue still holds up. I think it’s Moench’s signature work in comics and more people should discover it. Something I find interesting is how the MoKF formula was an accident (sort of). I was reading a MoKF letters page last night where an editorial reply noted that Moench steered the series toward espionage and MI6 because it provided a convenient excuse for why Shang-Chi would always be getting into trouble. When Shangi-Chi was a pacifist martial artist trying to escape his father’s shadow, the narrative drive of the character pointed him away from action; when he was a member of British secret service, it made more sense to have ninjas jump out of the closet every issue (and they didn’t all have to be Fu Manchu’s Si-Fan, either). From that expedience Moench now has a box-o-tropes to tell all sorts of stories, as well as a supporting cast, a rationale for mission-of-the-month storytelling with weird villains, and built-in external conflict. He also has a canvas to develop internal conflict for Shang-Chi as he grows to despise the dirty “games of deceit and death” that he must play for MI6, which are so at odds with his personal philosophy. And just like that the book evolves from a martial arts exploitation book good for a dozen issues into a minor classic that survived a decade or so. All kind of accidental, along with the fact that Moench and Gulacy were reportedly 007 fanatics, too. I can’t help but wonder if books like Deathlok and Killraven might have enjoyed longer runs if their creators had adopted an outside genre so thoroughly as did Master of Kung Fu. 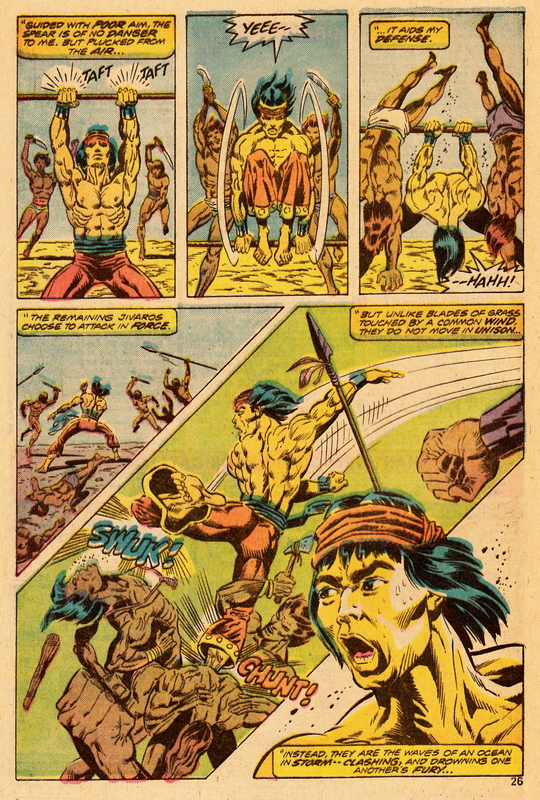 It is also worth remembering how young the creators were when they were doing this stuff — in 1974, Moench was 26, and Paul Gulacy was a tender 21. I cannot over-estimate how much MOKF meant to me in my youth. I grew up like Luke Skywalker (a farm-boy far from “where the action is”) … except for my eight sisters. When it was time for my high school self to move on to cars and girls and under-age drinking … leaving comics in my rear view mirror … I couldn’t do it. I needed the escape that I got from reading comics. The ones that demanded that I continue to read them were MOKF and Tomb of Dracula. The path for my future life was set and I didn’t even know it at the time. Thanks for reminding everyone how great this stuff was. In high school, I explained how and why I loved comics by showing MOKF to my high school principal. He read them … and then he understood. It is the special blog indeed that attracts comment from both the Dwo and Tom Mason. Now I just need the Ulm to chime in and I’ll hit for the cycle. I’ve long known that you were in love with both MoKF and Tomb of Dracula (which returns to Longbox Graveyard in two weeks), but strangely I don’t think we’ve ever really sat down and talked about it. A subject for the next time you are down for dinner. (And here is my obligatory prodding for more Funny Book Fanatic). We’ve talked about this before, but that’s one of the great things about the new writers that came into Marvel in the 1970s. Guys like Starlin, Gerber, Moench, McGregor all had this burning desire to tell stories that matched their interests and needed those books on the outer edges of the Marvel Universe as their playground. In the excerpt of Howe’s book that I read, he notes that a guy like Gerber was no good writing a by-the-numbers issue of Spider-Man, but give him Defenders, a talking duck and a super-hero formed from a jar of peanut butter and he can let loose. Same with McGregor. Toss him a potential loss like Jungle Action and you’ve suddenly got a Black Panther epic exploring race relations, royalty, colonialism, what it means to be hero and leader, revolution, African politics and all kinds of nifty stuff you’re not seeing in Fantastic Four. 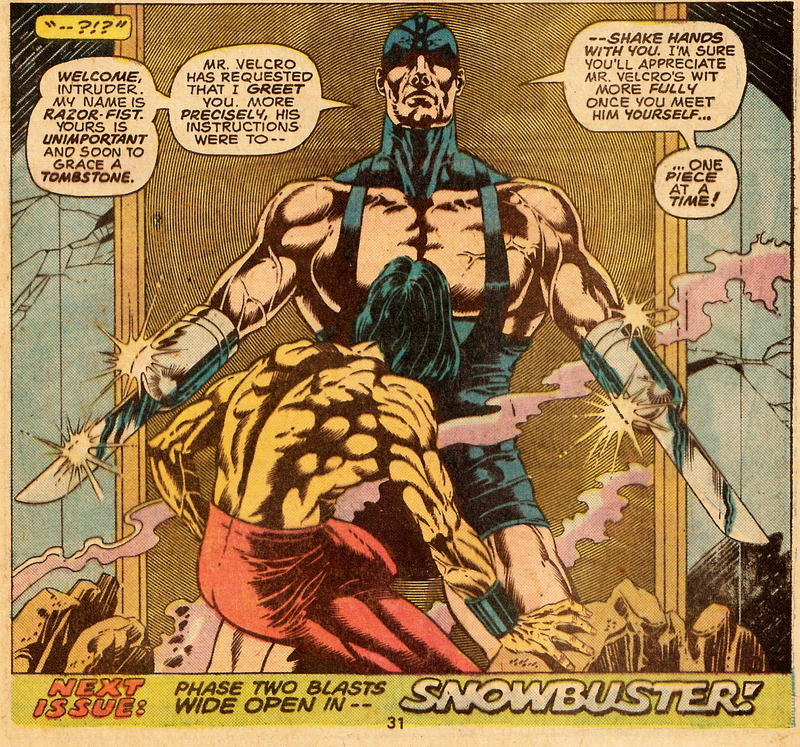 Whether by accident or design or combination, Moench’s move of MoKF from kung-fu exploitation book to Bondian spy thriller sure worked and gave him (and Marvel) one of the longest-running books to come from that era. Yep … and another insight I got from Howe’s book was that in the Roy Thomas Editor-In-Chief era (when a lot of those books and creators flowered), there wasn’t a lot of editorial oversight on the lower-selling books, creating a kind of “anything goes” environment where those great and ground-breaking stories took root. That’s the era when I fell in love with comics and I always wondered why I never got hooked on books like Spider-Man or Fantastic Four, but couldn’t get enough of all the weird stuff at the margins of Marvel’s line-up. Now I know! Games of deceit and death…I love this comic, always have, always will. Are you also a fan of Deadly Hands of Kung Fu? I’ve only read a few issues, but I know it had plenty of martial arts action, and lots of stuff about Bruce Lee and his co-stars. Aside from Savage Sword of Conan, I read very few of Marvel’s magazines in the 1970s — they were too expensive for me (being a kid scratching around for quarters to buy comics). 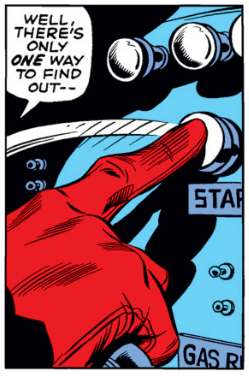 I was about to ask if Marvel had published a collection of Deadly Hands but I expect they’re stuck in that same, weird Kung Fu limbo as the rest of the early Shang-Chi stuff. A shame. With the advent of the Master of Kung Fu Omnibus and Deadly Hands of Kung Fu Omnibus being released this year, the folks over at the Masterworks Message Board were seeking “The Definitive MOKF/DHOKF Chronologic Reading Order”.